Our young artists have many unique opportunities within various disciplines. Whether it's traveling to another country or working within the local community, our students are encouraged to experience art and culture beyond the classroom. Below are a few recent examples. 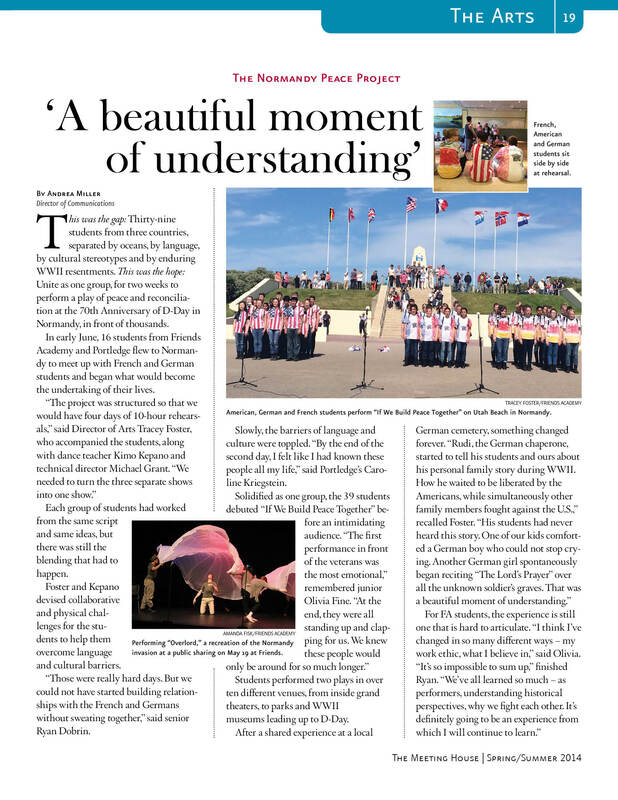 After 10 months of rehearsals, the Normandy Peace Project finally culminated in a week-long series of performances at the official 75th Anniversary D-Day Celebration in Normandy, France. Twelve Upper School students worked alongside four Portlege Upper School students perfecting collaborative creative movement pieces that spoke to the history of the D-Day invasion, peace, acceptance and understanding, while similar groups of high school peers in Germany and France did the same. Just four days prior to the D-Day celebrations, the three countries united to meet each other, learn how to perform with each other and build an incredible new multi-national relationship. We have the unprecedented opportunity to work again with the students of the Bergschule Saint Elizabeth in Heiligenstadt, Germany on a peace project that develops communication, collaboration and team building around the theme of U.S-German relations during and post WWII to the present. Students will research, reflect upon, and dramatize their combined effort, during exchange visits to the US and to Germany.